Darla Sims has written the ultimate crochet pattern book for crocheters that are obsessed with the ripple stitch. 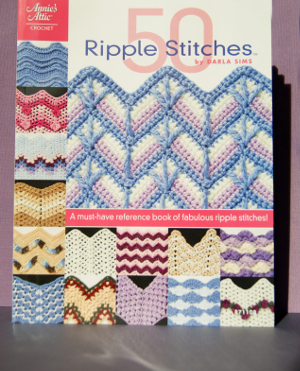 Just as the tagline says, this crochet book is "A must-have reference book of fabulous ripple stitches!" Flipping through the book, I couldn't help but "ooooh" and "ahhh" at all the new ripple stitches. Each one seems even more exciting than the next and immediately my thoughts went to how I can use these stitches to create gorgeous afghans. Just imagine the royal ripple afghans made with the Gemstone Stitch or the happy holidays afghans crocheted with the Mistletoe Ripple. With patterns for just about every occasion you can think of, this crochet stitch book is great for the creative crocheter. Each pattern is easily understandable for both beginners and advanced crocheters. Complete with pattern notes, special stitch explanations, and a standard stitch guide in the back, this book has it all. The ripple stitch is a versatile pattern that every crocheter shoudl learn at some point. My favorite afghan at home is a large ripple afghan that my great aunt crocheted for my family. We treasure it and use it often on chilly nights. Use this ripple crochet book to crochet an afghan that will be cherished by your family for years to come. Chance to win a copy of One-Skein Baby Projects! Win a Free Copy of 101 Quick and Easy Crochet Stitches! Crochet Gift List from Crochet Today! Enter to Win the Cozy Afghan Collection!